A federal judge has just supported a Department of Labor-imposed minimum wage for foreign farm workers — a good decision made regarding a particularly obscure labor market, that for harvesting onions in Nevada. 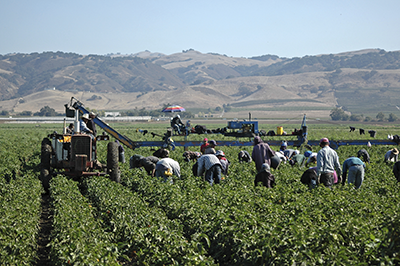 The lawyer for the growers unwittingly told the unvarnished truth about these rules, according to a Law360 news article, arguing that "the minimum wage rules for H-2A employers ... drive up wages for non-H-2A employers, who must stay competitive in the market to retain workers." That's exactly what the rules are supposed to do — protect American workers — and that's why it is good news that Nevada federal district court Judge Timothy Kelly ruled as he did. Every year for more than 50 years the Department of Labor had decided what the minimum wage rate must be, on an hourly and state-by-state basis, for employers using the H-2A temporary agricultural worker program. These are called "Adverse Effect Wage Rates" (AEWR) because if they are undercut, U.S. workers will be short-changed. They are routinely higher than the statutory minimum wage, which is currently a totally out of date $7.75 an hour. The 2019 AEWR in Nevada is $13.13, about the median for these wages compared to other states. I have been watching these rates since the spring of 1965, when I became the assistant for farm labor to the U.S. secretary of Labor in the LBJ administration. I worked for the late W. Willard Wirtz. That was the year that the old, exploitative Bracero program died, and our task was to try to find a little economic justice in the farm labor market. The Bracero program was a WWII-period scheme that brought Mexican males to U.S. farms, particularly in the West, to help harvest the crops; both organized labor (then stronger politically than it is now) and the Catholic Church were vehemently opposed to the program on the grounds of its ill-treatment of the migrants. The lawyers for the present-day growers tried to throw out the whole AEWR system, but Judge Kelly told them that the six-year-long, legislatively created window for such suits had long passed. The grower initiating the suit, which was supported by my old nemesis, the National Council of Agricultural Employers, is a Nevada onion grower, Peri & Sons Farms. Maybe the NCAE recruited them for the suit on the grounds of an attractiveness unknown to me, but the Nevada onion business seems to be an unlikely locale for such a suit. It is a relatively small-scale activity in a state better known for other economic activities. According to the most recent available crop data, the entire onion crop in the state was worth under $9 million in 2016, and reflected about 1.5 percent of Nevada's farm production that year. And if you take a farm labor issue to court in that desert state, someone is likely to ask — why grow labor-demanding crops in an area so far from a resident population that will harvest them? But bring the suit they did, producing a ruling that may prove helpful to workers in far larger labor markets than that of the desert onion harvest. Further, with so many federal judges ruling against attempts to enforce the immigration law, Judge Kelly moved in the opposite direction.